Research on clusters has reflected various policy initiatives and government interventions that target economic development, innovation, and growth. Cluster policy initiatives focus on specific industries and regions without clear definition of geographic or industry boundaries. This project developed an alternative approach to cluster research, which is based on clear definitions of industries, regions, and sub-regions, and a comprehensive dataset of the portfolio of activities for the entire population of firms, registered in the South East of England, UK. The originally designed multi-stage methodology utilises multiple and complementary statistical methods for mapping cluster membership and analysis of intra-cluster and inter-cluster relations. The clear geographic boundaries of the region of South East of England allowed us to select the entire population of registered firms (as for September 2002), and to allocate the entire regional population of firms into clusters according to their broad industry specialisation and diversification. We examine inter-industry relations through the diversification portfolios of large firms. Such relationships are interpreted as vertical and horizontal integration of activities within and across value chains. 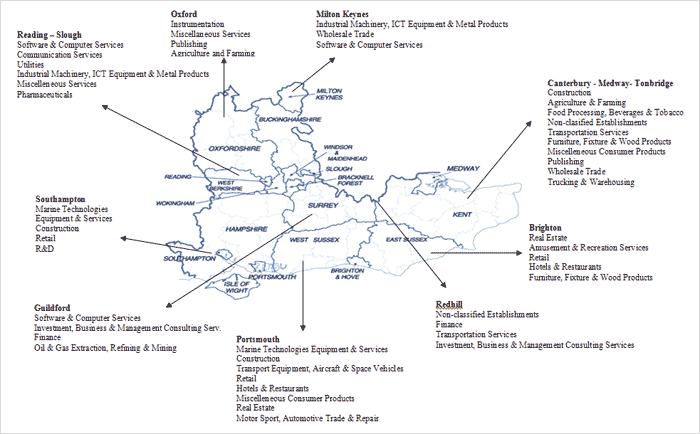 Structural maps of these value chains are produced for each identified cluster. Among the 31 clusters identified in the regions, the largest clusters are in Investment and Business Data Services, in Computer Services, and Business and Management Services. This research contributes to the long-term strategic orientation of the Government to identify clusters and regional agglomerations of firms that generate economic growth. The project corresponds also with the European efforts to identify models of regional economic development and to compare best practices across European member states.